What do you get when you mix together 4 losers, quiz competitions, girls and a lot of hormones? You get the indie comedy film Brahman Naman! 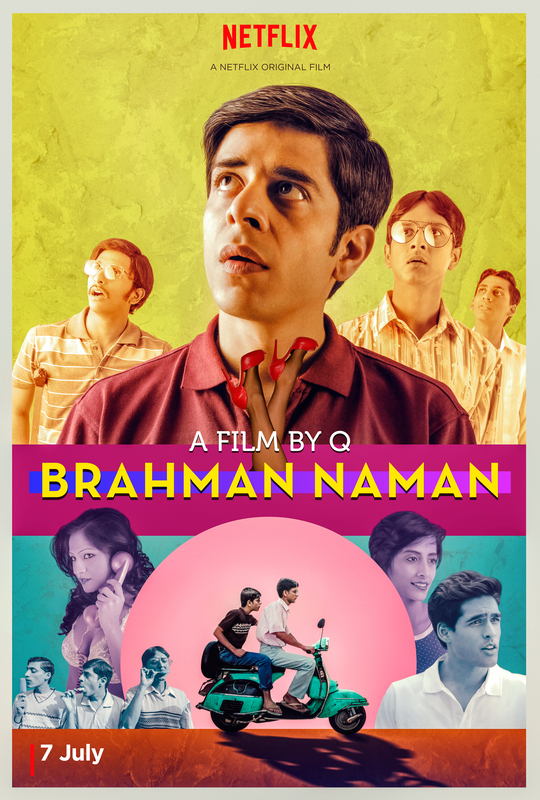 Written by Naman Ramachandran, Brahman Naman is directed by Indian indie director Q (Gandu, Tasher Desh and Ludo). This In-Betweeners style coming-of-age comedy backed by a rock anthem score is set in 1980s Bangalore. Know-it all teenager Naman (Shashank Arora), and his fellow nerdy mates Ajay and Ramu win every local quiz competition and get hammered on the prize money. Then their big chance comes as the All-India Quiz Final in Calcutta is announced. The three quiz musketeers set out on a chaotic train ride north, but on the journey Naman has a mighty crush on the super-quiz heroine Naina. Naman and his mate’s quest for glory by outsmarting their rivals gets confused with exploding testosterone levels and the trio slide into a mad-cap adventure with hilarious consequences. After screening at the prestigious Sundance Film Festival, the film made its debut on Netflix, garnering great reviews and views. The offbeat comedy is getting ready for its premiere at the London Indian Film Festival tonight. I got the chance to talk with writer Naman Ramachandran about creating the world 80s Bangalore, the quizzes, the characters and more! Check out what he had to say about Brahman Naman. What was the first spark for this story? The spark for the story was when Steve Barron and I were in India working on Prakash and we were in Bangalore for close to four months. Every evening, I would take him to my club and there we would meet all of these old quizzers from like 25 years ago – all my mates. He would sit in the corner and he would listen to all of our stories of the good old days. When we got back to London, he said why don’t you write this up as a script. It can be really funny. So I did and here we are! Then how did it develop from there, taking those stories and putting them all together in a full-length feature film? Tell us about working with Q. We sent Q the script and he absolutely loved it. He came onboard immediately. We had seen his earlier work – Gandu and Tasher Desh, and I thought and Steve thought that Q’s intensity and energy would work for the script. It was a very interesting experience working with him. I was there on set as well. We shot the whole film in 22 days. There was calm, there was storm and there was everything else in between as well. Yes, I was involved in all the casting and on set I was mainly the script supervisor. I also was the diction coach because the boys and girls had to speak in a certain way – that certain English speaking slow drawl. That was how people spoke in Bangalore in the 80s. Both Q and I wanted to recreate that slowness. You know, it was a time without mobile phones or multichannel television or all of that. Because these kids are millennials, we workshopped with them for about five weeks to get them into that space. In general, the whole idea was to keep it slow and deadpan as possible to reflect the 80s. What did you think of Shashank Arora as Naman? I thought he has done a great job. In fact everybody, even the most minor character, I think, has done an amazing job. That is what really makes the film work. That’s true, because you felt like you were in that world, no character was a wrong note. Q had a lot to do with that. See we had the cameras rolling even during the workshops. He told the boys and girls to imagine that someone is making a documentary on your life and this thing is going to be in your face and there all the time – so get used to it. And they got used to it and that is why they are not self-conscious in front of the camera. Because that camera was in their face for five weeks before the shoot began. For me, Shashank Arora as Naman had somewhat the look of a young Shah Rukh Khan, was that something that was intentional or just happenstance? No, it was not intentional at all. You know we were only looking at him as Naman, it was only during the shoot that we noticed, and ‘Oh there is a resemblance’. It was completely coincidental. One of the things I noticed was the boys all had a very interesting body language. Was that something that was just them or was that something that developed, as they became the characters? We wanted them to have the body language of losers, which is what they ultimately are in the film. For Shashank, we just told him to observe me since I was there and observe all the physical tics that I have and incorporate that into his character, which I think he has done brilliantly. Then Ramu, well he broke his foot three days before the shoot so we had to write that into the script rather than find a new actor. We also showed them footage of quizzers and told them to observe the body language of those people and become chameleons. Did you base your characters on real life? They are formed by some real life characters but mostly they are composites. You will find a little bit of X in Naman and a little bit of Y and obviously what they brought themselves to the character and what they had inferred from the script. It was very interesting how much stronger and wiser the girls in the movie were than the boys. What do you think is the most important thing about making a film like this? It is basically to push boundaries and to tell a story that has never been told before in the Indian context so to speak. There has been one documentary about quizzing, but apart from that there has been nothing committed to film about these English speaking elite. Whether it was the boys or the girls they were all a part of that upper middle class urban English speaking elite. You don’t see that in Bollywood or in the regional films speaking our native languages so that is something that we wanted to bring out. Basically creating a world that no one has seen before. Q and I and a few others were of that time, the rest were all millennials so we wanted to imbue them with our spirit. The film was showcased at the famous Sundance Film Festival. When we were selected for Sundance that was something really exciting, we really were not expecting it. Then we found out we were in competition at Sundance so that was like the cherry on the cake. So then how exciting was it to find out that Netflix had picked it up? Once the whole Netflix thing happened everything became surreal. We were ecstatic because rather going through the usual process here we were getting distribution in 192 territories in 22 languages. We really could not have asked for more. You are getting ready to premiere at the London Indian Film Festival, what makes that so special? There is a lot of interconnectivity because Steve Barron, the producer, he saw Q’s film at the London Indian Film Festival and that is when we decided to request Q to direct the film. And as you know I program the festival, so it is kind of like a homecoming for me. Also the film is being played at the British Film Institute Southbank and that is like a cathedral of cinema in the UK. It is the best movie theater in the country. To play at that particular venue is a huge honor. What are your thoughts on the increase in popularity of Indian independent films the world over? Two things. One is that films are getting better and better. The second thing is that especially in the last 2-3 years the world is sitting up and taking notice and it not just Sundance it is also Venice, Rome, Toronto, Rotterdam, Tokyo, Busan. I mean last year Busan opened with Zubaan, it was the first time that Busan had opened with an Indian film. It is the combination of the two, I think, the filmmaking is getting better and the world is recognizing it and showcasing it. Things can only get better from here. What do you think of Hindi films today? Well, there will always be a market for the big commercial films and people want their entertainment and they get it. But if you look at the new age and not necessarily independent films like Vikas Bahl’s Queen, these are films for the mainstream audience but telling different stories. How would you describe the tale of Brahman Naman and if asked why someone should see this what would you say? It is a coming of age comedy directed by India’s leading independent filmmaker. You should see it because you have never seen anything like it before. Brahman Naman, which you can see on Netflix now if you’re not in London to see it at the festival, stars Shashank Arora as Naman, Tanmay Dhanania and Chaitanya Varad as his sidekicks, and features Biswa Kalyan Rath, Vaiswath Shankar, Sindhu Sreenivasa Murthy and Sid Mallya.